Mr Gunni said that the five militia members worked for two years in Sabari LOS since 2016. 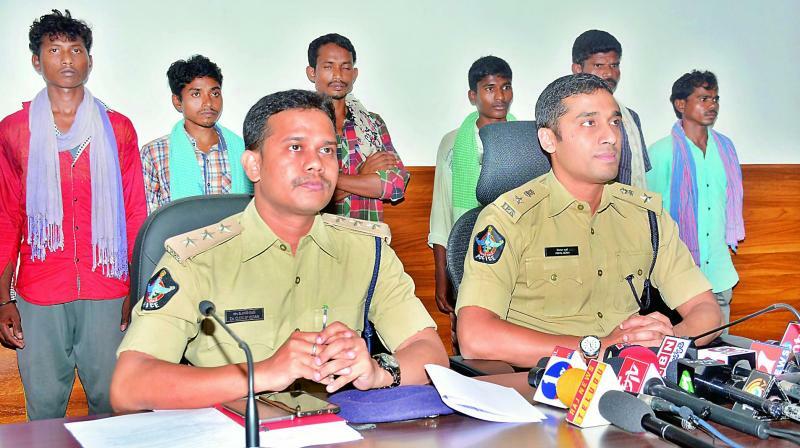 Kakinada: One member of the Sabari Dalam and five militia members of local organisation squad (LOS) surrendered before the Superintendent of Police Vishal Gunni on Monday. Mr Gunni told reporters here that Vanjam Motu of Bandigumpu village of Pega panchayat in Chinturu Mandal, militia members Diridi Devaiah of Pungutta village of Pega panchayat, Muchia Chukkaiah, 34, Diridi Ingaiah alias Vikram, 18, Madakam Bandaiah, 30, and Madakam Idamaiah, 34, surrendered before the police. He informed that Motu worked for a year and eight months as Dalam member in Sabari LOS and guard and protection team of BK-EG divisional committee secretary azad from June, 2007 till 2019. He was involved in two incidents of exchange of fire (EOF), an ambush and three murders. He was instrumental in putting up posters and distribution of pamphlets at Cheria main road along with other Dalam members. He was involved in the murder of Duvval alias Raghu in Pujarikanker area along with Haribhushan alias Lakma Dada and the murder of Irpa Lakshmana Rao alias Bharat in Chinutlam village in 2018. He also murdered Kosaiah at Yerram village of Chattishgarh state. He carried .303 Rifle. Mr Gunni said that the five militia members worked for two years in Sabari LOS since 2016. They planted IEDs in nine incidents in different cases on Edugruallapalli to Pega village road of Chinturu mandal along with other militia to attack security forces especially at Edugurallapalli shandy. They dug up roads and cut down trees between Balimela and Pega village with other militia members. All militia members used to conduct meeting when Maoists visited and provided shelter, logistics support and food to the Maoists. Chinturu police, under the guidance of additional superintendent of police (OSD) Amit Bardar, Chinturu sub-divisional police officer O. Dilip Kumar, Chinturu sub-inspector P. Srinivas Kumar, circle inspector B. Venkateswara Rao made continuous efforts to bring them to the normal public life, Mr Gunni said.